PERMINATOR HP underslab vapor barrier is a new generation of polyolefin-based resin/chemical technology. PERMINATOR HP provides the vapor barrier industry with a highly effective, economical choice for helping to reduce the penetration of moisture and water vapor through the slab into the structure, thereby helping to reduce fungus, mildew, and mold growth. PERMINATOR HP also helps reduce radon gas from entering the structure. PERMINATOR HP is tough enough to withstand normal construction jobsite conditions and traffic. It will not crack, puncture, snag, split, or tear easily. PERMINATOR HP prevents uncontrolled moisture from entering the slab allowing the slab to maintain the maximum slab moisture emission rate and relative humidity level as allowed by flooring manufacturer’s specifications. PERMINATOR HP rolls require fewer seams in application. Installation is quick and easy. All joints/seams, both side and end, should be overlapped 6″ (152.4 mm) and taped using 4″ (101.6 mm) wide PERMINATOR TAPE from W. R. MEADOWS. PERMINATOR HP rolls fast and smoothly over level tamped soil or compacted fill. PERMINATOR HP underslab vapor barrier is primarily designed for underslab construction, where the soil has been tamped and leveled or compacted fill has been applied. The 200′ (61 m) long sheets are unrolled as is or cut to size and installed using the overlapping method. Overlaps are 6″ (152.4 mm) wide and these seams are sealed using 4″ (101.6 mm) wide PERMINATOR TAPE. PERMINATOR HP can also be used as a protection course for waterproofing membranes. The desired sheet lengths are cut to size and retained at the top of the waterproofing membranes by PERMINATOR TAPE or TERMINATION BAR from W R. MEADOWS. Rolls require fewer seams in application. PERMINATOR HP prevents uncontrolled water vapor from entering the slab allowing the slab to maintain the maximum slab moisture emission rate and relative humidity level as allowed by flooring manufacturer’s specifications. *Factory welds are available if larger width rolls are required. 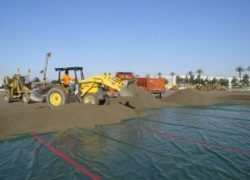 Meets or exceeds all requirements of ASTM E1745 Class A, B & C.
Surface Preparation … Level, tamp, or roll earth or granular material beneath the slab base as specified by supplied architectural drawings. Follow ASTM E-1643-10 (standard practice and procedure for installation of vapor retarder used in contact with earth or fill under concrete slabs). Reference American Concrete Institute (ACI) 302.1R-04: Chapter 4, Section 4.1.4 – Base Material for sub-grade preparation prior to placement of PERMINATOR HP. The most efficient installation method includes placing PERMINATOR HP on top of the footing and against the vertical wall. This will sandwich PERMINATOR HP between the footing, vertical wall, and poured concrete floor. (See illustration on page 2.) This will help protect the concrete slab from external moisture sources once the slab has been placed. Seal All Protrusions … Cut a slit around pipes, ductwork, rebar, and wire penetrations to place the initial layer of PERMINATOR HP. To further protect the concrete slab from external moisture sources, use a piece of PERMINATOR HP and place a collar around this as well. Cut a piece of PERMINATOR HP a minimum width of 12″ (304.8 mm). The length should be 1.5 times the pipe circumference. With a roofer’s knife or scissors, cut “fingers” half the width of the film. See Figure 1. Wrap around and tape the collar onto the pipe and completely tape fingers to the bottom layer of PERMINATOR HP, as shown in Figure 2. In the event that PERMINATOR HP is damaged during or after installation, repairs must be made. Cut a piece of PERMINATOR HP large enough to cover any damage by a minimum overlap of 6″ (152.4 mm) in all directions. Clean all adhesion areas of dust, dirt, and moisture. Tape down all edges using PERMINATOR TAPE. NOTE: It is not necessary to overlay PERMINATOR HP with gravel or sand. PERMINATOR HP is tough enough to withstand normal construction abuse and traffic. Most flooring companies recommend the placement of the concrete slab directly on the vapor barrier. We agree, since this eliminates the potential for trapping moisture in a blotter-effect, causing it to resurface through the slab into the flooring systems. Consult local building codes and regulations, plus architectural and design firm guidelines, prior to application. Vertical Wall Application … Install MEL-ROL® waterproofing membrane or MEL-ROL LM liquid waterproofing membrane from W. R. MEADOWS according to installation instructions. While the membrane is still tacky, install PERMINATOR HP as a protective course over the applied waterproofing membrane. Using TERMINATION BAR with concrete nails or PERMINATOR TAPE at the termination of the waterproofing membrane is advisable in some applications. Supervised care must be taken during backfilling against the material so that it is not damaged or punctured. If damage occurs, patch using the techniques outlined previously. When applying PERMINATOR TAPE to foundation walls, MEL-PRIME™ adhesive from W. R. MEADOWS may be used to increase bond. MEL-DRAIN™ rolled matrix drainage system is designed to remove moisture from around footings and to relieve hydrostatic head pressures. Several different versions are available. MEL-ROL LM or POINTING MASTIC may be used for stakes, small pipe, and rebar penetrations. Cut PERMINATOR HP just big enough for the penetration. Liberally apply MEL-ROL LM or POINTING MASTIC around the penetration to keep the integrity of the PERMINATOR HP membrane intact. MEL-ROL LM can be applied by brush, roller, or sprayer. POINTING MASTIC can be applied by caulking gun or trowel. PERMINATOR TAPE is a self-adhesive tape for use in sealing vapor barrier seams and attachment to footings, protrusions, etc. It is offered in 4″ (10 cm) widths and roll lengths of 180′ (55 m)/roll. It is packaged twelve rolls per carton. Coverage: One box of tape will adhere approximately 10 rolls of PERMINATOR HP. TERMINATION BAR is provided in 10′ (3 m) lengths to attach PERMINATOR HP to walls as a protection course for vertical surface waterproofing applications. PERMINATOR HP underslab vapor barrier does not negate the need for relief of hydrostatic heads. A complete drain tile system should be placed on the exterior of the footing and, in severe cases, on the interior of the footing as well. For maximum concrete performance and durability, the concrete floor slab design should provide for the lowest possible slump, yet assure complete hydration of the concrete.